The entire Suite from Swan Lake (Op. 20) and the Waltz from Sleeping Beauty (Op. 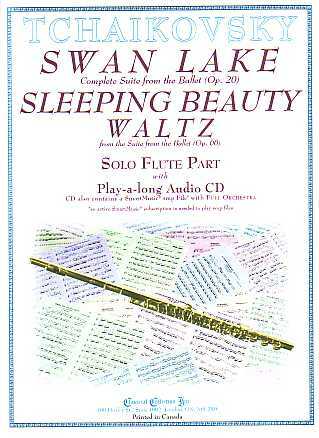 66) are presented as a Solo for Flute, Clarinet or Alto Saxophone with a play-a-long Audio CD which also contains SmartMusic SMP Files. 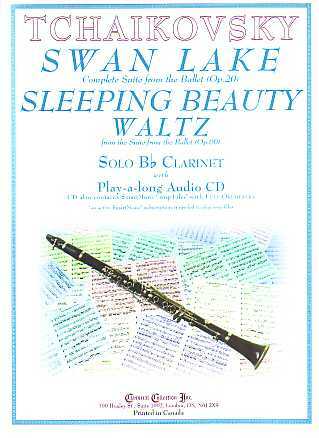 This edition of the Swan Lake Suite and the Sleeping Beauty Waltz is ideal for anyone who is studying or listening, to better understand and, in general, enjoy the wonderful music of these outstanding works! Duet Books and Piano Accompaniment are also available. Pyotr Il’yich Tchaikovsky (May 7, 1840 to November 6, 1893) is the most famous Russian composer of the Romantic Period (1825-1900). Surprisingly, Tchaikovsky was not included in the “Russian Five” - Modest Musorgsky (1839-1881), Alexander Borodin (1833-1887), Mily Balakirev (1837-1910), César Cui (1835-1918) and Nikolay Rimsky-Korsakov (1844-1908) because his musical training was felt to be too influenced by German music. 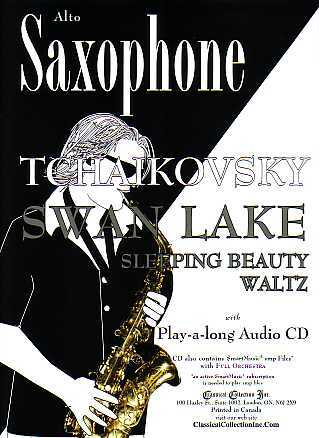 Tchaikovsky is best known for his 6 symphonies and 3 ballets - Swan Lake (Op. 20, 1875-6), Sleeping Beauty (Op. 66, 1888-9) and The Nutcracker (Op. 71, 1891-2). In this arrangement of the Suite from Swan Lake, to make for “more friendly” key signatures, No. 1, 2, 3 & 5 have been transposed up a semi tone and No. 4 & 6 down a semi tone. In addition, the first 17 bars of No. 4 (a Harp Cadenza) have been omitted.